If you haven't tried or even considered trying any of the squash recipes I have posted this winter so far....let this be the one! It is so universally appealing and delicious. I just think it would be the perfect thing for any family dinner or party. The first time I tried this pie was at my friend Nicole's townhouse. She was hosting our weekly med wives get together and the Ogglet and I were the only ones in attendance that week. 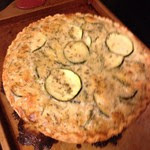 Well, once I tried this yummy pie I knew I just had to help her eat as much as possible ;-) It has a mild flavor since the base is Zucchini and is just overflowing with butter which I'm not sure how that can be bad. So, Nicole got this simple recipe from her mom and we're not sure where her mom got it just that it's been a family favorite of theirs for years. My sweet friend was kind enough not only to share her family recipe but, to allow me to share it here. After making it this past weekend I am convinced that it should be in everyone's repertoire. This is the perfect thing for a side at dinner or a potluck. It reminds me a little bit of a quiche so, I think it would be perfect for brunch as well. But, when ever or wherever you make it just get ready for compliments because it is yummy! 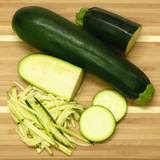 Cook zucchini with butter and onions until softened, then add the rest of the ingredients. Place in pie crust and bake for approximately 25 minutes. note: I actually found that I had to bake for more like 40 minutes but, I did put the pie on a cookie sheet which might have slowed the cook time??? Not sure since I'm not much of a pie baker but, I'm glad I took this step since the pie definitely bubbled over a bit and would have been a big mess in the oven if I hadn't. Now, the only part you might have trouble with is believing that Zucchini is a winter squash. All I know is that I just bought a bunch of Zucchinis and it IS winter! But, more importantly it starts with Z and I'm thinking this is the only way to properly end this series. Please, if you've tried any of the squash recipes post a comment and share what you thought of it. And if not, go make this now! You won't regret it. I think I'm going to make this tomorrow. I can't wait!!! Making it again tonight. It's become a family favorite :) Love you friend!!! First I am a wife and mother. My husband is a first year Orthopedic Resident. My 2 year old daughter, our Ogglet, is the light of our lives and I'm not quite sure what we did for fun before she came along ;-) Also, I am a SAHM who in my pre-baby life was a furniture sales woman, lifeguard and administrative assistant among other things. My part-time gig now,and then, that I LOVE is Mary Kay. Also, I am a christian which guides much of how I think and choose to live day to day. Something that colors all of these aspects of my life is a recent revalation that I also am ADHD. What is a Mesh Wi-Fi Router System, and Do You Actually Need One?